Hot chips is the popular neighbourhood store for residents of twin cities. We get hot potato chips and also other fries like bitter gourd chips and jack fruit chips in these stores. Later it became a one stop shop for traditional homemade sweetmeat and snacks like chegodilu, murukulu and pappuchekkalu etc. 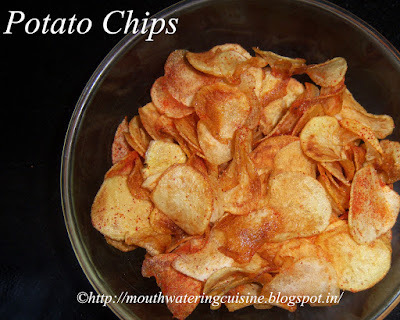 Instant Potato Chips or Potato Chips from Hot Chips are the most favorite junk food of kids. We will find these chips in every small occasion like birthday parties, family get together and kitty party. They grab them fistful and ask for some more every time. Though they are expensive, they are must in parties. I am no exception, but conscious about the oil used and of course the cost. Instead I tried them at home and they were like the ones we buy in the store. Kids loved them very much. I thought of making them with only two potatoes and ended up in making 5 potatoes approximately weighing 300 grms of them. I got 100 grms of chips. Peel the skin of potatoes and put them in water. Heat oil in a kadai till the fumes comes up. Lower the flame and again heat it for few more minutes. 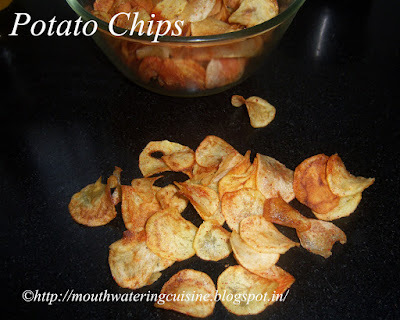 Hold the chip maker over hot oil kadai and carefully slice the potatoes directly into the hot oil. Fry them till they become crisp in low flame only. Drain the excess oil with the help of a slotted ladle and take them onto a kitchen paper. Do the same with all potatoes. Till such time keep the potatoes in water only. Once all are ready add salt and red chilli powder and mix well. Serve instant potato chips any time.